The PAD London art and design fair began this week in London, with 68 galleries showing work. We've chosen eight of the best contemporary pieces inspired by the natural world, including charred wooden chairs and a mirror adorned with feathers. 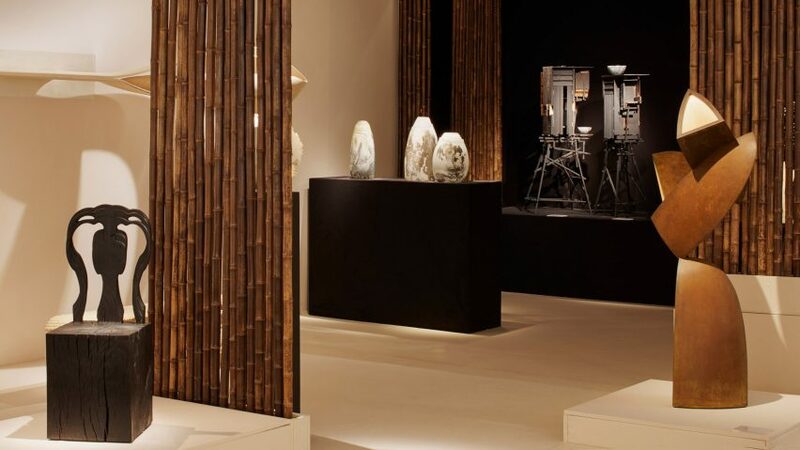 The London version of the fair is in its 12th edition and runs alongside the original event in Paris, with PAD also taking place in Geneva this year for the first time. The Willow light was designed by Lara Bohinc after visiting an overgrown Japanese garden, and produced at her workshop in Italy. Bohinc was also informed by Victorian architectural features, such as glass houses, cloistered archways and heavy cushion tassels. "It's about nature, but also about how nature is presented, with glass houses," said Valentina Rito at Gallery Fumi. Despite the organic form of drooping weeping willow branches, Bohinc chose to make the light from hand-blackened brass "to lend a feeling of timelessness, weight and ancient substance to the form," according to the gallery. Irish artist and designer Sasha Sykes's screen on the Peter Petrou stand is constructed from panels of cold cast resin that contain pieces of deep sea seaweeds brought to the coast of Ireland during Hurricane Ophelia. The seaweeds appear to swirl across the resin. Sykes collected, dried and treated the pieces of seaweed as quickly as possible so that they didn't lose their shape. "It has to be dried before it goes in to the resin," she said. "And then it comes back to life. You get the colours, you get the feel, you get the forms." "There was never really any industrialisation in Ireland. We went from farming to pharmaceuticals. We should have a much closer relationship to the sea, but we're actually quite scared of it," she explained. Parisian Gallery Avant-Scene presented a cabinet by Italian designer Andrea Salvetti, who died last year at the age of 49. Salvetti lived and worked in Tuscany and saw his work as part of the wider culture of biodynamics in the region. Inspired by the trunk of a tree, the piece consists of three cast brass boxes stacked up on top of each other, with cross-sections of a tree's trunk balanced between them. Each box opens to reveal a small cabinet storage space. "He was very much interested by nature, because nature is life," the gallery told Dezeen. "You can express nature by lots of means so it's not really a contradiction to express nature through metal. It seems a bit odd but in fact it makes a very strong creation." The Hack chair is produced with a computer numerical control (CNC) machine using green timber, then finished by hand, before being burnt using the Japanese technique of yakisugi. "It's about the maker's mark and about the relationship of digital to handmade. We often don't really understand how objects are made when they're mass produced, but all those processes are open to a craftsman or designer," said Gareth Neal to Dezeen. The solid block base contrasts with the chair's detailed Georgian-style back. Neal believes this makes the chair "instantly recognisable as a chair back, but to repeat it three times, it's like a glitch." Harris's work takes inspiration from the masters of the Dutch Golden Age of painting. Viewers can move between a selection of animated art pieces, including subtly moving vases of flowers in the Dutch still life style. Switching between different graphics is possible by touching the screen, and a cascade of petals follows the viewer as they walk past the work. The pieces use a graphic processing unit that computes several millions of operations every 10 milliseconds to generate the volumetric lighting, and complex interactive animations. Ceramicist Kate Malone's crystalline-glazed stoneware pot was brought to the fair by specialist ceramic and porcelain dealer Adrian Sassoon. The piece combines two elements of her work over the last few decades – overtly nature-inspired items and her atomic magma series, and stands at just over 30 centimetres tall. The exterior is adorned with chunks of "atomic" matter and carefully entwined oak leaves to give an impression of subverted natural forms. The Plume mirror designed by Olivier Gagnère appears to be compressed in the middle and is surrounded by a border of feathers giving it a soft organic form. The structure is made from wood and foam, while the feathers are tinted. The mirror is available in grey, red, violet or crimson, with the latter appearing on the stand at PAD. Osanna Visconti di Modrone created this bookshelf from bamboo sticks from her own garden, that have been cast in natural bronze. These are then arranged in slanted, overlapping forms as they might have grown, to provide a stable structure for the three horizontal shelves.